We are a small collective of award winning content creators, focused on absurdist comedy, geek media and storytelling. Although the vast majority of us work elsewhere in the industry professionally, Snowgum is a creative outlet for the more personal projects and ideas. 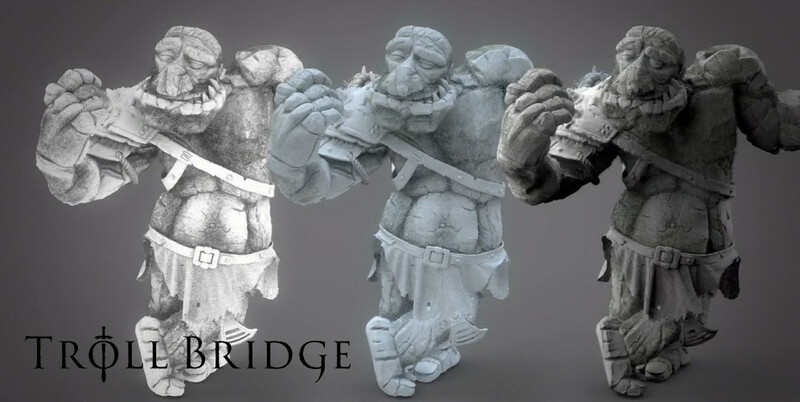 Nerdeo: Your latest project is Troll Bridge – what is it? Troll Bridge is a large scale short fantasy film, based on the Discworld story by Sir Terry Pratchett. It’s about the world’s oldest barbarian coming to grips with civilization, and whether he has a place in it anymore. Accompanied by his talking horse, he embarks on a suicidal mission to combat a troll… a troll now living in the deep mountain wilds – under the impossibly huge and long forgotten, fabled “Death Bridge” of myth and legend. Nerdeo: Where did the idea for Troll Bridge come from? Troll Bridge was born out of the desire to see the Discworld presented on a cinematic scale. Pratchett often tackles big ideas, and craftily uses the standard fantasy tropes and grammar to present them to the audience in a different light. To translate to film we need to do the same – but with a focus on satirising filmic devices rather than narrative ones. Our blue print for world building has been Milius’ Conan and Jackson’s Lord of the Rings (the original stories Terry also draws from). These are large scale, epic tales. The film needed to feel like it belonged in those worlds for us to understand exactly where these characters were coming from and for the emotional payoff to work by the end. It’s a small personal story presented in the largest scale possible. It’s about what the characters get up to when you put the book down or hit stop on the media player. It’s meta taken seriously and with consequence. Under the Snowgum banner we’ve won awards for almost all our stuff in one way or another, primarily in the short festival circuit. Blood on the Game Dice is possibly one of our more popular films and focuses on a group of friends playing Dungeons & Dragons over the course of an evening. It’s a chaotic comedy – which is how we like it. Collectively, the answer is a little different. There are just over 200 of us working in post-production on Troll Bridge, so the joint experience somewhat broadens. We have people who have come from working on Marvel and Will Smith films, to picking up VES Awards, to working on Game of Thrones and Star Wars, to Ninja Turtles and Gravity and even some through gaming… you name it! We’re lucky to have some very experienced individuals guiding and contributing to the team. Nerdeo: We’ve heard this project has been going on for many years and has gone through a couple of crowdfunding campaigns. How has this affected your movie making process, the script and your team? Contractually we’re not allowed to make money from the film and it is considered a fan film (albeit a fan film with support from the Pratchett Estate and which Terry took an active interest in while he was with us). So it’s in unusual position as far as fan films go. Part of that contract means we are not allowed to profit from the exercise. This means that all the money we’ve raised (and we’re in the $140,000 ball park now) goes directly back into the production – so it looks good, and means that we aren’t cutting corners on quality. The crew have only the best material to work with, so there isn’t a lot of running around trying to make something work that normally wouldn’t due to budget constraints. Working on Troll Bridge should feel like an ease, and we spend a lot of time knocking down barriers, building tutorials, and laying everything out correctly to ensure that is the case. We want our artists working on shots, not bashing their heads against walls. Obviously because the team is entirely volunteer, all task completion dates are mutually agreed upon and you get to work in the departments you are most interested in working in. It’s important to us that our team are getting something out of this – Troll Bridge was designed from the ground up to launch and expand careers. Nerdeo: This is a pretty VFX heavy film! What software are you guys using to produce some the effects? Do you have a defined VFX pipeline? Our pipeline is handled by Shotgun, which is the world leader in this kind of thing. With an almost entirely remote team – across six out of seven continents and more time-zones than you could shake a sundial at, we simply couldn’t achieve it any other way. We spend a lot of time on Skype and emailing – and Shotgun is the virtual home that ties it all together to the shots and tasks that need to be scheduled and followed through with. It’s a very robust and sophisticated system, which allows for a great deal of customisation. It’s perfect for us. We store the entire film in its various components and formats on Dropbox (around 2.5TB) which is then painstaking linked back through to Shotgun – so everything is very easy to find and access. On the content creation side of things, we are using Modo and Maya for our animation, and Nuke for all our compositing work. We have sponsorship with The Foundry, so we are able to offer Modo and Nuke licences to our artists who are working on those tasks. Nerdeo: Are there any major features you would like to see implemented on nerdeo? Once you’re out of development – we don’t really have any suggestions. Nerdeo appears to have everything we need, I think it’s just a matter of tightening the nuts and bolts you already have in place. But that’s to be expected in development. Nerdeo: Could you give any advice to someone looking to get their indie films made? Surround yourself with supportive people who believe in the project – be enthusiastic and generous – and above all; communicate. Everything will fall down on your ability to communicate (both on screen and off screen), so become an excellent communicator – your film will depend on it. Also; don’t give up when it starts getting hard. The hard bits will be the bits that make you and your film unique.